It's so nice that sometimes a recipe so easy yields such delicious and useful results. Use this 2-ingredient combo - which takes less than 5 minutes to make - as spread on toast, a dip, or a filling for a sandwich (BLT!) or veggie wrap. It's only downside - to maintain its beautiful green shade, make right before - or less than an hour - before using. In a food processor, combine avocadoes, yogurt, 5 teaspoons lemon juice and 2 pinches of salt and fresh pepper. Puree until creamy; taste and add additional salt or lemon, if needed. 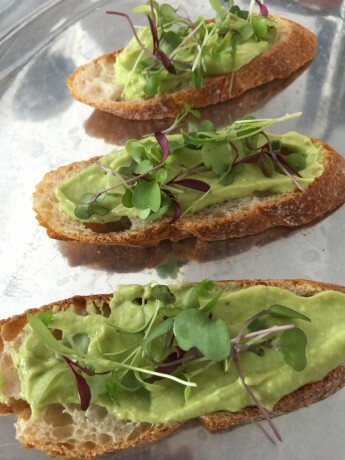 Toast bread, top with creamy spread and a garnish of micro greens. Picking avocadoes: I usually avoid very ripe avocadoes to avoid ones with brown spots inside. I have the best luck picking ones that are still a bit firm to the touch, making only a slight indent when pressed with my thumb. Slightly firm, yet ripe avocadoes are easy to slice or dice – and more importantly are usually fully green inside. Another trick: my neighbor and cook Molly Glasgow suggested once that if you remove the tiny brown cap at the top of the avocado and it’s bright green underneath, it will be green inside. Amazingly, this seems to be the case each time I check.